Girl, Paper, Scissors...: Patterns are everywhere! Another goofy title for this week's post I'm afraid. I had a little revelation while lying in bed the other morning half asleep. I'm in love with pattern. I'm thinking I have to do a scrapbook page all about it. It started when I was really little, and loved examining the bathroom tiles in our house for pictures in the abstract patterns. It was reinforced by the crazy wall papers my mom had back in the 70's, and the beautiful quilts made by my grandmother. The designs, the quilting, and the patterns of the fabrics themselves. I remember vividly the pattern on the entryway floor of my paternal grandmother's house, and the flower pattern on her tea mug. Or maybe I'll just keep scrapbooking! 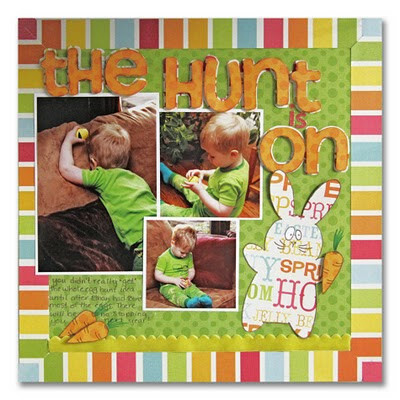 I'm not really a fan of die-cut titles, but I love the way the stamped images ( bunny and carrots) turned out on patterned paper. What I'm even happier about is having scrapped some photos of this Easter THIS YEAR! lol! What a gorgeous LO! LOVE that fun color combination and all the beautiful DP. Such great photos, too! This is an adorable LO!! Love the PP around the edges and the way you brought the stripes together!! Also lovin' that cute little bunny! Looks great on that PP too!!! We have just discovered your gorgeous scrapbooking artworks and found out you use STAEDTLER triplus ball ballpoint pens. We'd love to meet you on our facebook fanpage http://www.facebook.com/STAEDTLER.headquarters ! It would be great if you became a fan, too, and showed your artworks to all other STAEDTLER fans on our page.